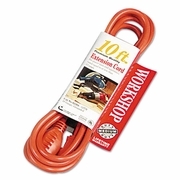 Coleman Cable Vinyl Outdoor Extension Cord, 10ft, 13 Amp, Orange. Vinyl jacket resists moisture, abrasion and prolonged exposure to sunlight. Sturdy reinforced blades and molded plug withstand repeated everyday use. Heavy-duty strain relief prolongs cord life. Outer jacket won't mark floors or walls. 125V.